It’s early afternoon in June on a small farm in eastern Rutherford County, and even in the shade, beads of sweat pepper Dr. Belinda Mendenhall’s smiling face. Down on one knee, she’s vigorously floating a horse’s teeth as she saws a small, metal file in and out of the mouth of Peanut, a mini-horse, taking the sharp edges off the creature’s molars. “Sometimes I get the naughty ones that want to tap dance on your head,” said the equine ambulatory veterinarian, who works with no fear. There are now more women veterinarians in the U.S. than their male counterparts (women outnumber men by more than three to one in veterinary schools, according to the American Veterinary Medical Association; the graduating class of veterinarians in 2007, a total of 2,489 students, was split 75.3 percent female and 24.7 percent male). But it is not a common sight in Middle Tennessee to see women vets manhandling the larger animals such as horses and cattle. 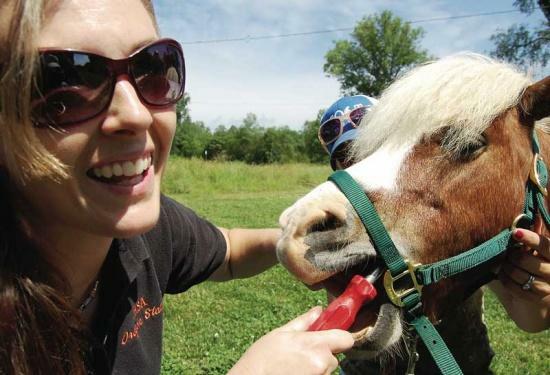 For this horse doctor, who lives in Eagleville, it was a case of love at first sight. Born and raised in the small town of Willamina, Ore. (population 1,885), Mendenhall flipped for horses as a child of 5. “I just love horses and animals and always wanted to be a vet. People tried to talk me out of it,” said the equestrian physician, who turns 30 years old June 16. “People are really hurting for rural vets. There is a big need for large animal vets. I do a lot of the smaller, one-two-three horse owners. I also take care of several larger boarding and training facilities. Earning her doctorate of veterinary medicine from Oregon State University in 2007, Mendenhall is no stranger to Middle Tennessee. During her teen years, she worked for a family in Oregon that trained horses for competition in the Tennessee Walking Horse National Celebration in Shelbyville. After practicing a year in Monroe, Va., Mendenhall came here two years ago and then opened her own practice in 2009. She operates out of Anderson Veterinary Clinic in Christiana, a small animal care practice, owned by Al and Jana Anderson, also Oregon natives and who are like second parents to her. They think she is a pretty fair vet with a flair for horses. Today, Mendenhall wears sunglasses, a black Oregon State shirt, blue jeans and boots. She said, “There are a lot of large animal vets around here, all really good vets. It’s a competitive market that’s for sure, but a lot are in the Shelbyville area. Like the old-fashioned country doctors of the early 20th century, Mendenhall makes house calls (or are they barn calls?) as she drives to such communities as Lascassas, Readyville, Woodbury, Walter Hill and Bell Buckle, notching about 200 miles a day on her white Ford Explorer. When her clients need convalescence, she “hospitalizes” them at Brookside Stables in Eagleville. For relaxation, the vet rides and shows horses. She owns five of her own: two riding mares, a mare and foal and a half-linger pony. “My hobbies are my horses,” she said. And a couple of times a month, she heads for Nashville so she can get her fix of live country music. While the job has its occupational hazards (“I’ve been kicked a lot and was kneed in the face once and broke a tooth”), Mendenhall plans to continue horsing around. “I enjoy people that have the smaller places. I like making a difference with horses and educating and helping people learn how to care for their horses. That’s my favorite part,” said the happy veterinarian.